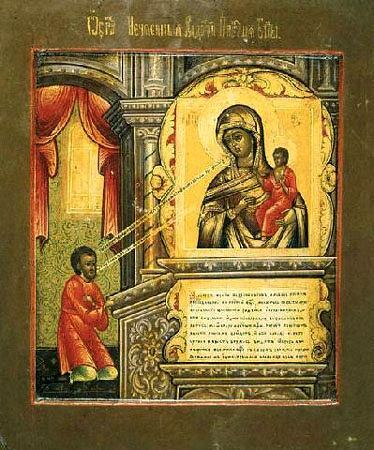 The Icon of the Mother of God, named "Unexpected Joy" (Nechayannaya Radost'), is written thus: in a room, upwards is an icon of the Mother of God, and beneathe it a youth kneeling at prayer. The tradition about the healing of some youth from a bodily affliction through this holy icon is recorded in the book of Saint Dimitrii of Rostov, "The Fleece of Prayer" ("Runo Oroshennoe") [for the significance of the "Dew‑Moistened Fleece" vide Judges 6: 36-40]. The youth out of habit was praying before the image of the All-Pure Virgin and suddenly he saw, that the image was alive, the wounds of the Lord Jesus exposed and bloody. In horror he exclaimed: "O Lady, who is it that hath done this?" To this he Mother of God replied: "Thou and other sinners by their sins do crucify My Son anew". Then only became apparent before him the abyss of his sinfulness, and for a long time in tears he prayed to the Mother of God and the Saviour for mercy. Finally, the unexpected joy of answer to his prayer and forgiveness of sins was given him.